Each year, Cente LifeLink EMS recognizes staff and volunteers with an awards banquet. This entry was posted in Uncategorized on March 25, 2019 by wpadmin. December 26, 2018—Centre LifeLink EMS has been chosen as Otto’s Pub and Brewery’s 6th Annual Holiday Tree Fundraiser recipient. Patrons can purchase a ribbon to decorate the tree for $5 a piece; all of these proceeds will go directly to Centre LifeLink EMS. Centre LifeLink EMS is a non-profit organization providing emergency and non-emergency medical services to the Centre Region. Centre LifeLink relies, in part, on donations to purchase and operate lifesaving services to our community 24 hours a day. If you can’t make it into the restaurant to purchase a ribbon, Otto’s has the option of purchasing one (and they will hang it for you) on their website at ottospubandbrewery.com. The fundraiser ends January 1, 2019. Pictured (left to right): Ian Arevalo, John Surkovic, Scott Packer, Matt Burnheimer, Kevin Franklin, Vicky Ponish, Jud Towner, Charlie Schnable. This entry was posted in Uncategorized on December 27, 2018 by wpadmin. A special thank you to photographer Chad McKissick and MC Jerry Fisher. This entry was posted in Uncategorized on March 28, 2018 by wpadmin. October 26, 2017– In an emer gency, the last thing you want to worry about is the bill. 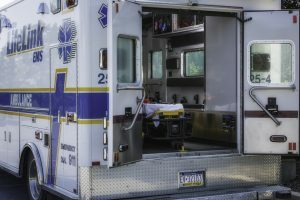 That is why each fall Centre Region residents are encouraged to enroll as a Centre LifeLink Member, ensuring them that they will have no out-of-pocket expenses for unlimited EMERGENCY ambulance service provided by Centre LifeLink EMS. 2018 Memberships are available beginning this month, and residents in Centre LifeLink’s coverage will receive a Membership Brochure with information on how to participate. 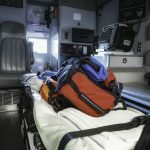 With many insurance companies raising the price of out-of pocket deductibles, members can save an average of $300 for basic life support calls and more than $500 for advanced life support paramedic service—these are the average costs non-members pay. Individual memberships are $50.00 and family memberships are $70.00 for a one-year period beginning January 1, 2018 through December 31, 2018. In addition to saving residents money, a Centre LifeLink Membership helps keep this vital service available in the community. As a non-profit organization with no tax support, Centre LifeLink relies, in part, on tax-deductible donations and funds raised through the Annual Membership Drive. Membership revenue and donations allow Centre LifeLink to purchase life-saving equipment. Centre LifeLink provides 24-hour emergency service for the Borough of State College, College Township, Harris Township, Ferguson Township, Patton Township, and mutual aid to surrounding areas of Centre and Huntingdon Counties. Residents of the Centre Region will receive a 2018 Membership Brochure in the mail and registration is also open online at www.centrelifelink.com. Any questions regarding membership can be directed to Centre LifeLink’s Marketing Manager, Lauren Shurgalla: lshurgalla@centrelifelink.com or (814) 237-8163. This entry was posted in Uncategorized on October 26, 2017 by wpadmin. September 8, 2017—Centre LifeLink EMS has been re-accredited for the 6th consecutive three year term (19 years) by the Commission on Accreditation of Ambulance Services (CAAS) for its compliance with national standards of excellence and exemplifying the “gold standard” of emergency medical care. 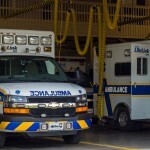 With this achievement, Centre LifeLink is only one of seven accredited ambulances in the state of Pennsylvania, and in the top 1% of ambulances in the Country. The Commission is a non-profit organization which was established to encourage and promote quality patient care in America’s medical transportation systems. The primary focus of the Commission’s standards is high-quality patient care. This is accomplished by establishing national standards which not only address the delivery of patient care, but also the ambulance service’s total operation and its relationships with other agencies, the general public, and the medical community. The Commission’s standards often exceed state or local licensing requirements. This entry was posted in Uncategorized on September 8, 2017 by wpadmin. 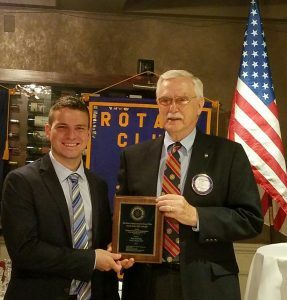 May 24, 2017-– Centre LifeLink volunteer EMT Ian Arevalo received the State College Sunrise Rotary Club’s 2017 Four-Way Test Award. The Four-Way Test Award, presented to local emergency service volunteers, recognizes local fire and ambulance volunteers within the State College area whose daily volunteer activities epitomize the “Four-Way Test”. Ian volunteered 2,361 hours in 2016 and was selected as Centre LifeLink’s “Volunteer of the Year” for 2016. Ian received this award alongside Rob Nese from Alpha Fire Company and Denny Johnson of Boalsburg Fire Company. This entry was posted in Uncategorized on May 24, 2017 by wpadmin. This entry was posted in Uncategorized on April 3, 2017 by wpadmin.